SueSan Chen, a junior from Columbus, Ohio pursuing a bachelor of science in Manufacturing & Design Engineering (MaDE) with the Segal Design Institute, noticed something was missing about the stunning Patrick G. and Shirley W. Ryan Center for the Musical Arts at Northwestern. Serving as a performance and practice building for Northwestern’s Bienen School of Music, the Ryan Center features a soaring glass atrium, with lounge and reception areas offering views of the lake and downtown Chicago. As an engineer-in-training who is passionate about human-centered design and seeking a future career working at the intersection of engineering and design, Chen saw an opportunity to make a positive impact through design. 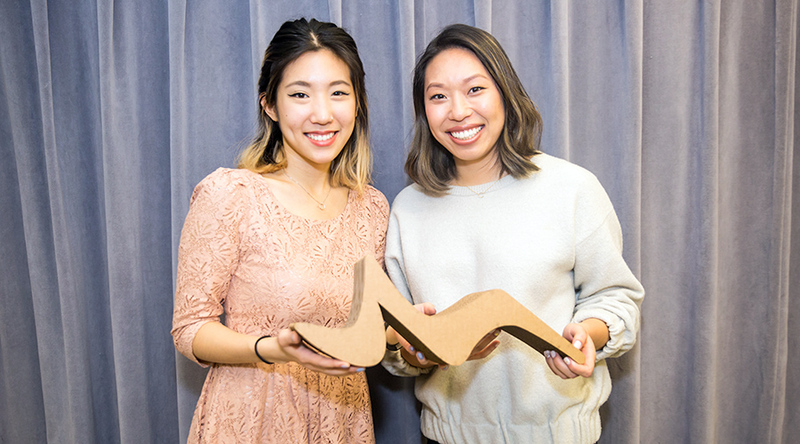 She teamed up with fellow Northwestern student Isabel Ngan, a senior majoring in Art Theory and Practice while pursuing the Segal Design Certificate, to create an innovative solution. In the Fall 2016 quarter, both Chen and Ngan were taking a course called “Industrial Design Projects” taught by John Hartman, an award-winning industrial designer and adjunct lecturer with the Segal Design Institute. “The course teaches human-centered design thinking through a series of self-directed design projects. Students learn how to first identify and frame a problem followed by applying creative and critical thinking throughout a complete design process,” explained Hartman. One of the class assignments, titled “EameSpiration,” challenged students to design public seating for a space on Northwestern’s Evanston campus. The assignment drew inspiration from the iconic designer Charles Eames. Eames once said, "The role of the designer is that of a very good, thoughtful host anticipating the needs of his guests." Eames famously used bent plywood and fiberglass to create chairs in partnership with his wife Ray Eames or other designers. For this reason, Hartman had students in “Industrial Design Projects” work in pairs for this assignment. During their creative process, Chen and Ngan conducted user interviews and the pair discarded numerous iterations before settling on their final design. They laser-cut and assembled corrugated cardboard layers to build the prototype at the Segal Prototyping and Fabrication Lab. Finally, Chen used Adobe Photoshop to create in-context renderings. Their final design is called Rest, inspired by the symbol for the quarter rest in music and the function of the Ryan Center. “I think it plays well with the environment [in the Ryan Center] because it’s utilized by so many music students. This would emanate as a music quarter rest, but above all it is a beautiful piece,” said Ngan. “Dealing with ambiguity and the need for self-direction in design can be difficult, but SueSan and Isabel proved to be quite intuitive at uncovering user needs and enjoyed confronting challenges while producing novel and innovative design solutions,” he said. Their prototype is 1/16th scale, but the pair hopes to make a full-scale model in the future with metal or wood. Next up, Chen is excited to pursue a career creating beautiful, intuitive products that improve the standard of living for people everywhere. Ngan wants to pursue a career in the fields of Art Direction within Marketing and Advertisement or Product and Package Design.